Nowadays the term of ‘nano’, which means 10-9 as the SI prefix, is commonly mentioned in the media. Usually, a human hair is taken as a means for lifelike recognition of 1 nanometer. One nanometer is 1/100,000 of a hair, which is too small to observe through optical microscope. When we consider that 1 nm is 3 or 4 atomic scale at the most, similar to DNA with the size of 2 nm, its very small size is true to nature for us. Hence, to control an individual atom and to reveal the mystery of the DNA of human body, ‘nanotechnology’ has been attracting great attention as one of the essential topics especially in modern scientific technology field. In particular, the fabrication of nanostructures with nanometer dimension in size is the starting point and essential part for the nanotechnology research. So far, device fabrication techniques for the computer memory as a representative example have been developed based on the top-down patterning process. However, as continuous scaling of the electronic devices with high integrity, currently used conventional optical lithography faces up to the resolution limitation in sub-30 nm scale regime. The techniques being used in nanoscale patterning with a high resolution are electron beam lithography, focused-ion beam etching, and scanning-probe-based writing. However, they may not be proper solutions because of their high cost, low throughput and time consuming techniques especially for large scale nanopatterning. Accordingly, a novel approach is needed for nanoscale device fabrication. Hereupon, to overcome these drawbacks, a bottom-up process put down roots as a new paradigm for the next generation device fabrication. This is in contrast to currently used top-down nanopatterning techniques as mentioned above. This process is to fabricate the nanoscale structure through the reaction between atoms or molecules. Nanostructures such as nanodot, nanotube, and nanowire have recently attracted considerable scientific and commercial attention because of their unique electronic, magnetic, and optical properties. However, to build nanostructures for the practical applications to the nanodevices, technologies to control the regular arrays of nanostructures are required. From this point of view, nanopatterning technologies based on selfassembled nanotemplates such as diblock copolymer, polycarbonate and anodic aluminum oxide (AAO) have attracted a great deal of interest for well ordered nanostructure fabrication. Self-assembly means that the structure is organized by itself during the fabrication process without any additional process. Among the various nanotemplate technologies, AAO nanotemplate represents one of the exciting frontiers in the nanotemplate research. This builds up the highly ordered hexagonal cell array of nanoholes under the electric field applied during the anodizing process. Deriving force for hexagonal arrangement is the repulsion originated from volume expansion in the alumina layer. Holes are formed by transfer of aluminum ion and oxygen ion at the interface such as alumina/electrolyte, Al/alumina, and pore bottom. AAO make it possible to fabricate nanostructure with the aspect ratio we desire because its interpore distance, hole size and depth can be easily controlled from variation of anodization conditions. For practical device applications, however, AAO templates should be formed directly on substrates to avoid problems such as complicated post processes. Meanwhile, to build nanostructures by filling the high aspect ratio holes of the nanotemplates, the quality of the resulting nanostructure is fundamentally determined by the conformability of the thin film deposition process. Based on this point of view, atomic layer deposition (ALD) is a promising process, which exhibits a good conformality as well as a good uniformity, atomic scale thickness controllability and low impurity contamination at a low growth temperature. 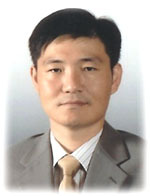 Professor Hyungjun Kim and his research team successfully developed the novel technique for the nanostructure fabrication. The team suggests that a hybrid nanofabrication process combining ALD with an AAO nanotemplate has good opportunities for the fabrication of well-ordered nanostructures. The fabrication of metal nanostructures using ALD combined with a nanotemplate has rarely been reported although metallic nanostructures have various applications such as memory devices, fuel cells, nanosensors and nanocatalysts. So far, electrodeposition has been extensively used to fabricate metal nanostructures using AAO templates. Although electrodeposition has a good gap filling ability, it requires a conducting seed layer, which makes the whole process complicated. Moreover, the fabrication of nanotube structure is quite difficult by electrodeposition. Meanwhile, ALD is a proven technology for mass production, especially in the semiconductor device industry, and nanotubes can be easily produced by ALD. The research team performed the newly developed hybrid process. The AAO nanotemplates with various aspect ratios and hole sizes were fabricated directly on Si substrates, which exclude the complicated post processes. By combining Ru ALD and AAO, they fabricated various Ru metallic nanostructures including nanodots, nanowires and nanowire array devices.